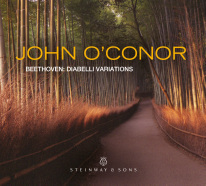 John O'Conor is sometimes called a "Poet of Piano" for his ability to play with particularly expressive phrasing, depth of tone color, and a technique that can make piano playing look like a lark. His specialties are Classical and Romantic music, and he is best known for his recordings of Beethoven's complete piano sonatas and the works of fellow Irishman John Field. When O'Conor first told his parents he wanted to be a professional musician, giving up his love of rugby, he got the usual response of laughter followed by concern that he couldn't earn a real living. (This was the same response he had to his son Hugh's announcement that he wanted to be an actor.) O'Conor's studies began at Dublin's College of Music with J.J. O'Reilly, and, after he received a scholarship from the Austrian government, continued in Vienna under Dieter Weber. He studied Beethoven's music with Wilhelm Kempff, which in 1997 led to leading the annual Beethoven seminar at Kempff's villa in Positano, Italy. He was awarded first prize in Vienna's 1973 International Beethoven Piano Competition by unanimous vote and the Bösendorfer Piano Prize in 1975. 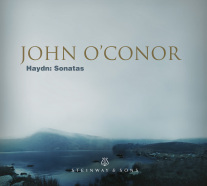 It was his first release in the series of complete sonatas of Beethoven for Telarc that brought O'Conor to the attention of the world in 1986, completing the cycle in 1994. As an exclusive Telarc artist, he alone has done more to revive interest in the life and works of John Field than anyone else. His initial Field recording of 15 of the Nocturnes spent several weeks on the Billboard charts. O'Conor has an active travel schedule, going around the world to perform recitals and orchestra concerts, frequently combining these with master classes and seminars. He coaches piano chamber music, as well as the solo and concerto repertoire, and serves on the juries of several international piano competitions. He is director of the Royal Academy of Music in Dublin and founder and chairman of the Dublin International Piano Competition. O'Conor's interest in young musicians has led to his receiving an honorary doctorate from the University of Dublin and being decorated by the French, Austrian, Italian, and Polish governments.